Are your kids ready to graduate from a piggy bank and start learning what it really means to juggle chores, personal goals and money-making opportunities? Parents Jennifer and Gregory Beck developed a system that makes it easy for the whole family to keep track of what needs doing, who’s doing it, and what’s at stake. The fisherkids system is based on three main categories: household responsibility (everyday tasks and extra chores), personal accountability (did you do what you were supposed to do?) and financial responsibility (divvying the money you earned for saving, spending and giving). 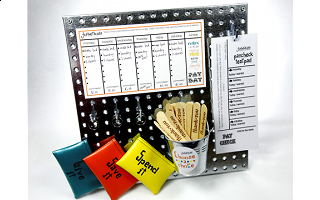 It’s all organized on a sleek metal pegboard that has plenty of space for the system’s chore sticks, weekly responsibility charts, paycheck notepads, and money bags. Everything is in one place, which makes it much easier to commit to than a haphazard collection of to-do lists, piggy banks and sticker charts. Plus it’s appealing to kids: They can decorate the system in their own style and really take charge of their expectations and accomplishments. Heather Jackson and Stacey Young introduced us to fisherkids. They each have three kids, and Heather said, "We needed order in our homes and this system gives children a sense of ownership and responsibility, plus they'll have more compassion for what busy moms do day after day." Good habits start young, and the fisherkids system is a great way to teach kids the importance of teamwork, the value of hard work, and the satisfaction of earning money. Happy Monday, everyone! We are so excited to introduce our products to you! Our family has worked diligently to create a responsibility station for children and teens that puts all the spheres of learning in one place....household responsibility, accountability, and financial management. Parents work tirelessly to raise responsible children and this is one way to engage your kids, teach your kids, and keep it all organized in one spot of the house! As parents, we are the ultimate teachers, and our goal is to have our children function independently once they fly the coop. Our products help you do just that. We call ourselves fisherkids because we don't want to fish for our kids, but rather teach them to fish! Check us out and chat with us....we are happy to answer any questions you may have! Hi Jennifer - We like the looks of your organizational system. My daughter just turned 12 and she's wondering if you can tell us how the teen system is set up. Are there any particular differences between it and the FisherKids board that is highlighted on today's Grommet? Thanks. @Beth: I will let Jennifer expand, but the Teen Version Includes one 16" X 16" magnetic pegboard, hanging hardware, pegboard hooks, dry-erase weekly responsibility magnet, paycheck notepad, chore chooser, chore sticks, 3 money bags, goal setting checklist, and parent's guide. The main differences are that it includes a goal setting checklist and has a more sophisticated paycheck notepad. @Beth: I'm glad you like it! For the teens, we added goalsetting and made the overall look a bit more appropriate. The Grommet Partner has told us that the Teen version is no longer available. I have 2 kids, does that mean I buy 2 kits? @ML: For two kids you would need to get one kit and one add-on kit. The board itself will be able to support the items for up to three kids. Hey Jennifer, I have been a daily grommet fan for a long time! I turned Fisher Kids in as one of my favorite products! Glad to see they finally added your awesome chore board and reward system!!! Can't wait to try the teen addition. @Heather Jackson: Thank you for submitting fisherkids as a Grommet. You have a great eye for products that would make a good Grommet. Keep the ideas coming! 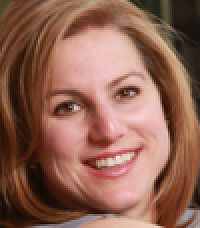 @Heather Jackson: HI! Thank you so much for submitting this! I just saw that it was you! They even took our product with them to a back to school segment on a news channel in Boston! Thank you so much, Heather! Is it me, or is the "details" area blank?? @Yvonne: If under the Details tab you are seeing the word details, click on it to see if they expand. Google Chrome made an update that is causing this issue. Hi! I have been looking for a better way to organize chores/responsibilities for my four children (ranging from 13 to 5) and this looks like it might work. They are used to dividing allowance into church, save and spend but right now we have four different chore charts and it's just kind of a mess. :-) But I don't fully understand how your system works based on the photos and description. Would you be able to give a little more description of how it works in practice? Thank you! @Shonna: Here is an introductory video that we created. I hope it's helpful. Thank you for your interest and support! We donate quarterly to charity events, and at this time, we are finishing up our homeschool trial. We will definitely take your comments into our thoughts for future product development. We do also have an app for 1.99 in the app store (Savings Setter) that is at least the financial component to our system. Are your kids ready to graduate from a piggy bank and start learning what it really means to juggle chores, personal goals and money-making opportunities? Parents Jennifer and Gregory Beck developed a system that makes it easy for the whole family to keep track of what needs doing, who’s doing it, and what’s at stake. The fisherkids system is based on three main categories: household responsibility (everyday tasks and extra chores), personal accountability (did you do what you were supposed to do?) and financial responsibility (divvying the money you earned for saving, spending and giving). 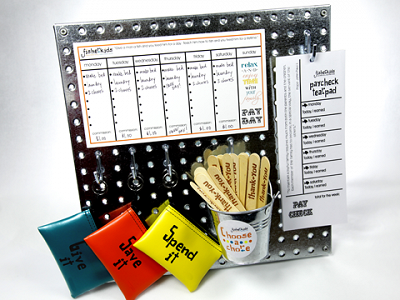 It’s all organized on a sleek metal pegboard that has plenty of space for the system’s chore sticks, weekly responsibility charts, paycheck notepads, and money bags. Everything is in one place, which makes it much easier to commit to than a haphazard collection of to-do lists, piggy banks and sticker charts. Plus it’s appealing to kids: They can decorate the system in their own style and really take charge of their expectations and accomplishments.